Protocol – Choose either UDP or TCP. Server Address/Port – Enter server address in the first field and port in the second one – 1194 if you set Protocol to UDP or 443 if you chose TCP. Please visit our server list to find out address of the server you wish to connect to (You need to be logged in to see server address field). Username/Password Authentication – Checked. Enter your VPNExpress credentials in the newly appeared fields. Poll Interval – 0 (default). Redirect Internet traffic – Checked. Accept DNS configuration – Disabled (default). Encryption cipher – Choose AES-256-CBC from drop down list. Compression – Choose Enabled from drop down list. TLS Renegotiation Time – -1 (default). Connection retry – Set to -1. 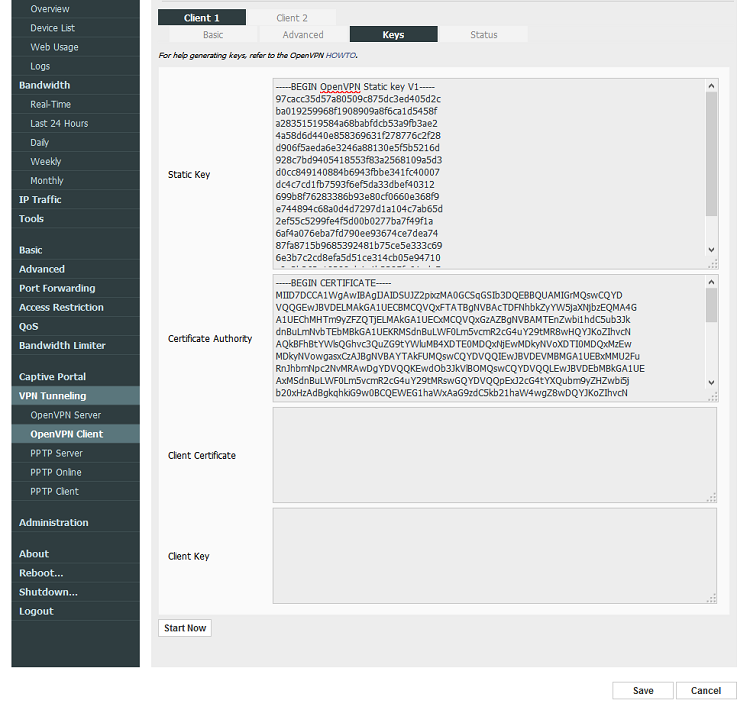 Verify server certificate (tls-remote) – Unchecked (default). Custom Configuration – Leave empty (default). 5. Proceed by clicking on Keys tab. Download OpenVPN configuration pack and extract it. Find a configuration file for the server you were setting up and open it (in this case at1.vpn.express.udp1194.ovpn). Static key – in this field copy and paste text from to block. Certificate Authority – in this field copy and paste text from to block.